Antiviral activity of medicinal plants of Nilgiris. Vijayan P1, Raghu C, Ashok G, Dhanaraj SA, Suresh B. Medicinal plants have been traditionally used for different kinds of ailments including infectious diseases. There is an increasing need for substances with antiviral activity since the treatment of viral infections with the available antiviral drugs often leads to the problem of viral resistance. Herpes simplex virus (HSV) causes a variety of life threatening diseases. Since the chemotherapeutic agents available for HSV infections are either low in quality or limited in efficiency, there is a need to search for new and more effective antiviral agents for HSV infections. Therefore in the present study 18 plants with ethnomedical background from different families were screened for antiviral activity against HSV-1. Different parts of the plants collected from in and around Ootacamund, Tamil Nadu were extracted with different solvents to obtain crude extracts. These extracts were screened for their cytotoxicity against Vero cell line by assay microculture tetrazolium (MTT) trypan blue dye exclusion, proteins estimation and 3H labeling. Antiviral properties of the plant extracts were determined by cytopathic effect inhibition assay and virus yield reduction assay. 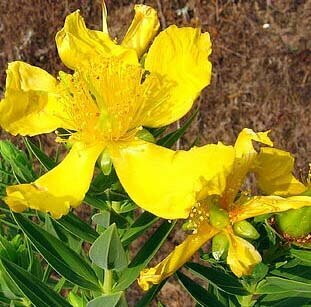 Three plant extracts Hypericum mysorense, Hypericum hookerianum and Usnea complanta exhibited significant antiviral activity at a concentration non toxic to the cell line used. The extracts of Melia dubia, Cryptostegia grandiflora and essential oil of Rosmarinus officinalis showed partial activity at higher concentrations. Some of the medicinal plants have shown antiviral activity. Further research is needed to elucidate the active constituents of these plants which may be useful in the development of new and effective antiviral agents.